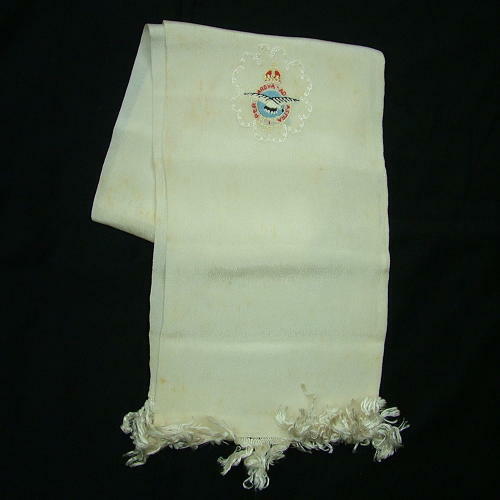 White/cream rayon scarf with hand embroidered RAF King's crown crest to one end. Tasselled ends. Approximately 108 x 18cm. Typical of those made by fighter pilot and airmans' wives and girlfriends utilizing commercially available patterns. Scarves were often worn to help prevent neck chafing during combat manoeuvres. Some yellowing, spot marking and creasing but in reasonably good used condition overall. Stock code M20568.